RayKo’s 6th Annual Plastic Camera Show includes stunning and sometimes surprising images made by the crappy camera-toting winners of this competition (often the cameras themselves are more tape than plastic. Not just being held together with bits of electrical tape and black gaffers tape, but the tape also makes these cheap cameras light tight…not that the light leaks don’t often make the resulting pictures even more interesting). Photographers from all over the Bay Area as well as national and international artists are featured in this dynamic exhibit. Each year we receive thousands of entries and this year was another challenge to select only 90 compelling pieces. Why does the plastic camera continue to be so popular? Is it because the toy camera is a backlash to this digital age of photography? It could be nostalgia for the soft, square pictures with vignetted edges. It could just be nostalgia for film and the latent image- you actually have to wait to see what you shot! Or it could be love of the creak of the cheap plastic dial as you wind it, wondering if it will break off. (Forget Instagram and the rest of them, this is the real deal). It could be too that we all missed the simple freedom of making pictures that aren’t perfect, that don’t have to be sharp or real or saturated or taken with a camera that costs thousands of dollars. All you need is $35 (or less) and a roll of film, and you’re in business. After seeing the exhibit, you may be inspired to start shooting one of these beauties yourself. Luckily RayKo is offering a class where you can reconnect with the simple joys of photography and have the ultimate plastic experience. Christine Zona will be teaching a 2-week class on Plastic Cameras starting March 16th, in the midst of this exhibition. 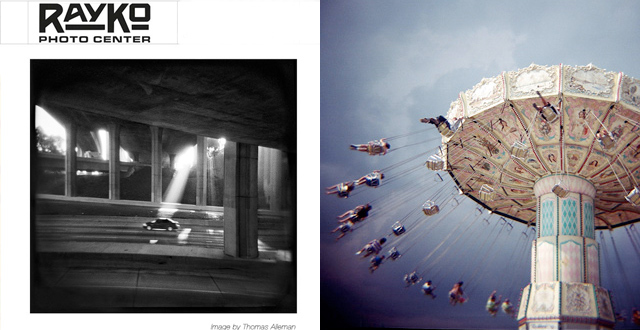 Also highlighted in this year’s plastic camera exhibit is the work of LA-based artist, Thomas Alleman. 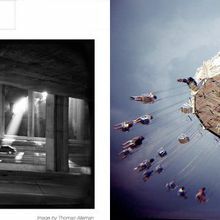 He began making “urban landscapes” with a medium-format Holga---a $17 toy camera---in September of 2001, in the immediate aftermath of the 9/11 terrorist attacks. His heart was shattered then, and his career was momentarily ruined. In that upside-down time, Alleman truly had nothing better to do than walk all day, every day, in Los Angeles’ many strange neighborhoods, shooting with a camera that couldn’t see straight. The Holga’s many laughable failures are well known and all-encompassing: focus, exposure and parallax are effectively un-controllable, and the plastic lens is always aberrant, cloudy and vignetted. Much to his surprise, however, the freaky results of that technical dysfunction resembled precisely the pictures he’d been dreaming of in those nightmare days. By obliterating the hyper-detailed, documentary specificity that modern multicoated lenses have made commonplace, the Holga’s bizarre optics have given Alleman access to a realm of richly-textured suggestion, impression and allusion that he couldn’t achieve in his earlier attempts at the lyrical landscape, which now seem banal and psychologically barren by comparison. As Alleman wandered LA’s wide, weird precincts, he had been concerned with certain crucial questions: What does it truly look like here, and why don’t the pictures that we show the world resemble the City he walks in every day? What is the meaning or value of history and authenticity in this transient environment, and what does the “authenticity” we fabricate say about us? What are the hidden codes and messages that are borne in the architecture and arrangement of the built environment? Finally, and above all else: what is his personal, alternate vision of the hackneyed local mythos? Alleman believes this body of work begins to address all those questions, and answers the last one with some conviction: these photographs from “Sunshine and Noir”, using techniques under-explored elsewhere, is a cast-eyed and meandering tone-poem about public space in the last Great American City. Come see the magic of Alleman’s pictures and all the images of the winners of this year’s plastic camera competition and experience nostalgia on more than one level. You can fall in love with Holga and Diana* and a world of other lo-tech cameras, like my new favorite, the Sprocket Rocket. RayKo Gallery serves to advance public appreciate of photography and create opportunities for regional and national artists to create and present their work. RayKo Gallery offers 1600 square feet of exhibition space and the Photographer’s Marketplace, which supports the work of Bay Area artists, and encourages the collection of artwork by making it accessible to collectors of all levels. The Photographer’s Marketplace offers photography collectors unique and affordable work from artists living and working in the surrounding area.